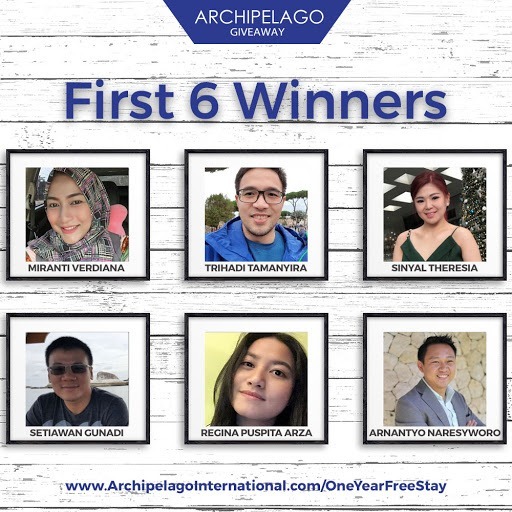 Jakarta, Indonesia, 30 March 2018 – Archipelago International is delighted to announce the first six of twelve winners of its Archipelago Membership “One Year Free Stay” Giveaway worth hundreds of million rupiah in value. The giveaway program is running for its second year and is the first of its kind in Indonesia, whereby winners can stay, eat, book meeting spaces, and even enjoy spa services using the winning gift vouchers. The winners are: Miranti Verdiana, Trihadi Tamanyira, Sinyal Theresia, Setiawan Gunadi, Regina Puspita Arza, and Arnantyo Naresyworo. A further six winners will be announced in the second half of the year. Each lucky guest was invited to their nearest Archipelago hotel to do a playful photo shoot receiving their gift vouchers. Their photos were shared to millions of people on Facebook and Instagram, turning them into mini celebrities. “We are thrilled to welcome the winners of the One Year Free Stay giveaway who may redeem their prizes at any of our 135 hotels in South East Asia to stay for free, eat for free, book meeting spaces for free, and even enjoy spa services for free using the prize vouchers. We also invite everyone else to download the app, enjoy the benefits, and be in for a chance of becoming one of the next 6 winners for this year-long giveaway.”, said Erika Anggreini, Archipelago International's Director of Marketing. Winners were selected at random from the emails of guests who have downloaded the Archipelago Membership App. In addition to receiving exclusive discounts and services, all app holders are automatically entered into the draw. Fans are encouraged to download the Archipelago Membership App at the Google Play or App Store, register, wait patiently and check Archipelago International's official social media pages each month for the winner announcements. For further information and details on the app and giveaway, please visit www.ArchipelagoInternational.com/membership. Currently, the fastest growing hotel management firm, Archipelago International holds Indonesia's largest portfolio of over 130 hotels (18,000 rooms) and 100 new properties under development across Indonesia, the Caribbean, Philippines, and Malaysia. Brands include Nomad Hostels, favehotel, Hotel NEO, Quest Hotel, HARPER, ASTON, The Alana, The Heritage Collection and Kamuela. Hotels range from ultra-luxurious villas to select-service and from economy-class hotels to serviced-apartment residences.